Committee in Solidarity with the People of El Salvador (CISPES) observers present preliminary observations to the Salvadoran media. March 9, 2015 -- TeleSUR English, posted at Links International Journal of Socialist Renewal -- The left-wing Farabundo Marti National Liberation Front (FMLN) has won 86 of the 262 mayorships of El Salvador in March 1 elections, including the capital San Salvador, according to preliminary reports, TeleSUR English said on March 4. The ruling FMLN also announced it won a legislative majority in the National Assembly and the Central American Parliament. The FMLN said it would now govern areas covering more than 65% of the population, compared to 45% in the past. FMLN Secretary-General Medardo Gonzalez told the Salvadoran people his party would continue efforts in favour of the more vulnerable sectors of society. The Supreme Electoral Tribunal (TSE) is yet to release the official electoral results, but Gonzalez said the preliminary results were accepted by “practically all the parties”. The TSE said it might take at least a week to finalise the election results. TSE president Julio Olivo said on March 4 that unidentified persons or groups had sabotaged the transmission of results. su visita a nuestro país y su incansable lucha en Colombia, incluyendo desde dentro de la cárcel. September 3, 2014 -- Links International Journal of Socialist Renewal -- Providing facts and analysis, and publicising and organising Latin America solidarity activities in Australia, Green Left Weekly and Links International Journal of Socialist Renewal has sought to promote greater understanding and solidarity between the people of Australia and Latin America. We are therefore delighted to publish Latin America Social Forum (Foro Social Latinamericano), a Spanish-language supplement produced regularly by the Latin America Social Forum in Sydney. Click HERE for more on El Salvador; for more by Marta Harnecker, click HERE. July 22, 2014 -- The new El Salvador government faces the challenge of deepening the pro-majority changes that have occurred, while updating the historic experiences of a fighting and conscious people seeking social transformation, said contemporary critical thinker Marta Harnecker, in an interview with weekly newspaper El Siglo XXI. See "El Salvador: FMLN wins presidency; right wing trying to steal election" for more detail. March 22, 2014 -- Links International Journal of Socialist Renewal -- In the first round of El Salvador's 2014 presidential election the FMLN candidate Salvador Ceren had a clear win over the runner-up, Norman Quiroga of the right-wing ARENA party. However he fell just short of the 50%+ required to be declared president. With the smaller parties dropping out there was a run-off between Ceren and Quijano on Sunday, March 9. Here is video of the voting process and an interview by Warwick Fry with Juan Campos, who travelled from Australia as an official observer. The FMLN's Salvador Ceren was victorious, much to the great delight of tens of thousands of Salvadoreans (below). 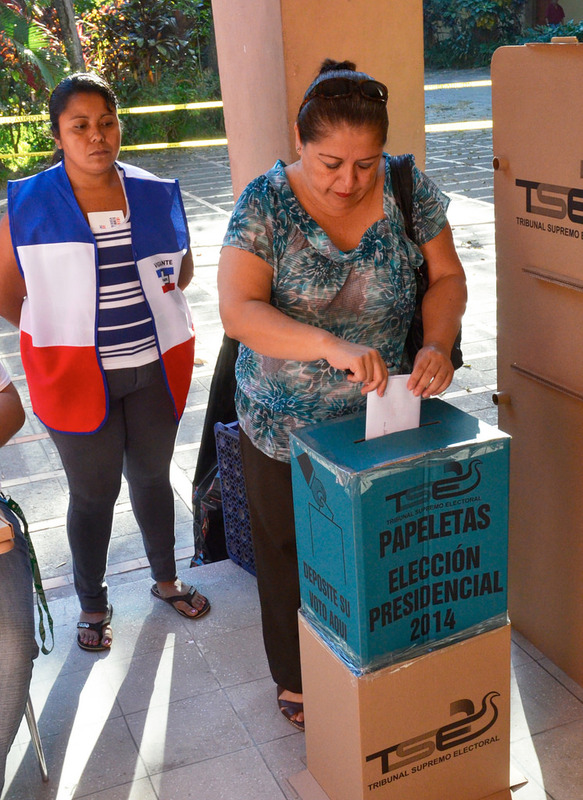 Salvadorans went to the polls on February 2. The union-backed party won the first round. The run-off is March 9. Photo by CISPES. Click HERE for more on El Salvador. February 6, 2014 -- Labor Notes -- On a hot and breezeless day at the end of January, representatives from 83 unions across El Salvador gathered in the Casa Sindical (a shared union hall) in San Salvador to greet a delegation of international election observers. We had come to ensure that the presidential election would be free of fraud, violence and intimidation. The images and names of their fallen comrades loomed on the walls behind them in black paint. Febe Elizabeth Velásquez. Juan Chacón. Ten unionists were martyred in a 1989 bombing by right-wing death squads, targeted because they were union leaders. Salvador Sanchez Ceren, candidate for the leftist FMLN party, gave a rousing speech on February 2 to announce victory in the first-round. February 3, 2014 -- CISPES -- With over 99% of polling places reporting, the candidate for the governing Farabundo Martí national Liberation Front (FMLN) party, Salvador Sanchez Cerén won handily the first round of El Salvador’s 2014 presidential election, earning nearly 49% of the vote. He holds a ten-point lead over Norman Quijano of the Nationalist Republican Alliance (ARENA), who placed second with 39%. Former president Tony Saca (1999-2004) garnered just over 11% of the vote. The FMLN and ARENA will head to a run-off on March 9. According to the CISPES electoral observation mission, which included delegates from the National Lawyers Guild and various US universities, the electoral proceedings were calm and peaceful. October 27, 2013 -- Links International Journal of Socialist Renewal -- Providing facts and analysis, and publicising and organising Latin America solidarity activities in Australia, Green Left Weekly and Links International Journal of Socialist Renewal has sought to promote greater understanding and solidarity between the people of Australia and Latin America. June 16, 2013 -- Links International Journal of Socialist Renewal -- Providing facts and analysis, and publicising and organising Latin America solidarity activities in Australia, Green Left Weekly and Links International Journal of Socialist Renewal has sought to promote greater understanding and solidarity between the people of Australia and Latin America. 1. 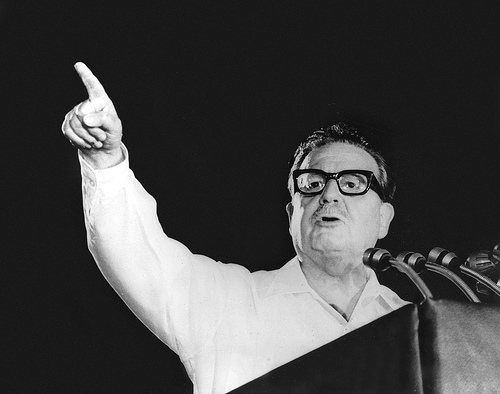 That the Farabundo Marti National Liberation Front (FMLN) is a political organisation that has the responsibility, recognised by popular majority and as a consequence of our long history of struggle, of constructing in El Salvador a society based on social justice; which is economically productive, environmentally sustainable and wherein all exercise and respect fundamental freedoms and inherent rights of the human being, as recognised in the Constitution of the Republic. 2. That the progressive and left-wing political and social movements, which are leading the struggles for democracy and social progress, are experiencing a period of growth and gain in various parts of the world, and particularly in Latin America and the Caribbean; proposing and winning solutions to the major problems confronting the world today. 2 décembre 2009 -- CADTM/Green Left Weekly -- S’adressant aux délégués de la Rencontre Internationale des Partis de Gauche qui s’est tenue à Caracas du 19 au 21 novembre (2009), le président vénézuélien Hugo Chavez a déclaré : « il est temps de constituer la 5ème Internationale. » Face à la crise capitaliste et la menace d’une guerre qui représente un danger pour l’avenir de l’humanité, « les peuples réclament » une unité plus forte des partis de gauche et révolutionnaires qui sont prêts à lutter pour le socialisme, a-t-il dit. A l’instar de son appel de 2005 pour la construction « d’un socialisme du 21ème siècle » et son appel de 2006 pour la création au Venezuela d’un nouveau parti de masse révolutionnaire – le Parti Socialiste Unifié du Venezuela – l’appel de Chavez à l’unité de la gauche et pour une nouvelle internationale est un événement historique. 2 de diciembre de 2009 -- CADTM/Green Left Weekly -- Hablando a los delegados del Encuentro International de Partidos de Izquierda realizado en Caracas, el presidente venezolano, Hugo Chávez señalo “que llegó la hora de que convoquemos a la Quinta Internacional. Frente la crisis capitalista y la amenaza de guerra que poner en peligro el futuro de la humanidad, la unidad de partidos de izquierda y revolucionario dispuesto a luchar para el socialismo “es un clamor del pueblo,” dijo Chávez. Como su llamado en 2005 a construir el “Socialismo de Siglo XXI” y su anuncio de la construcción de un partido de la revolución al final del 2006, el llamado de Chávez a unificar la izquierda en torno a la Quinta Internacional representa en hecho histórico. President Chavez addresses conference of left parties. 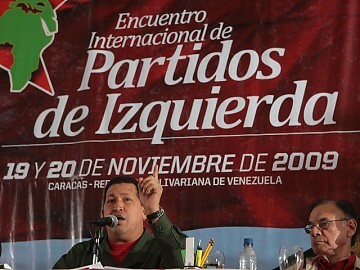 November 27, 2009 -- Addressing delegates at the International Encounter of Left Parties held in Caracas, November 19-21, Venezuela's President Hugo Chavez said that with the capitalist crisis and threat of war risking the future of humanity, “the people are clamoring” for greater unity of those willing to fight for socialism. Chavez with Comrade Saras,who represented the Socialist Party of Malaysia. November 23, 2009 – Venezuelanalysis.com – Venezuela's President Hugo Chavez called for the formation of a “Fifth International” of left parties and social movements to confront the challenge posed by the global crisis of capitalism. The president made the announcement during an international conference of more than 50 left organisations from 31 countries held in Caracas over November 19-21. Committee in Solidarity with the People of El Salvador, June 3, 2009 -- On June 1, Mauricio Funes and Salvador Sanchez Cerén were sworn in as president and vice-president of El Salvador at the Feria Internacional Convention Center in San Salvador. It was a magical day for the Salvadoran people, social movement organisations, and the leftist Farabundo Marti National Liberation Front (FMLN), which Funes and Sanchez Cerén represent. May 31, 2009 -- El Salvador -- On Monday, June 1, 2009 El Salvador will turn a new page in its history with the inauguration of the country´s first left government, joining the ranks of the majority of Latin America. Representing the Farabundo Marti para la Liberacion Nacional (FMLN, Farabundo Marti National Liberation Front) ), Mauricio Funes and Salvador Sanchez Ceren, president and vice-president elect, will face a national assembly in which the FMLN is outnumbered by more than 2:1. Out of a total of 84 seats, the FMLN only have 35. This will make broad sweeping changes difficult, but not impossible, and may force Funes to use the power of the presidential veto as a bargaining chip. It is important that those of us observing from a distance understand the complicated environment within which the new government will be operating. The new government represents a coalition of interests including the FMLN and its national grassroots system of committees, and a broad cross-section of civil society. More and more information is coming to light that despite the glowing picture painted by the outgoing right-wing ARENA party, the country is bankrupt -- the result of twenty years of failed economic and social policies, and rampant corruption by ARENA and its allies, the PDC and PCN. It is likely that the new government will discover the depth of the corruption and mismanagement after it assumes office. March 19, 2009: Real News Network report of the FMLN's presidential election win. February 26, 2009 -- Committee in Solidarity of the People of El Salvador (CISPES) -- Polls on the March 15 presidential vote show the election will likely open a new progressive chapter in El Salvador's long, violent history of war and dictatorships with a victory by the left-wing FMLN, which is promising to build a people-centred government. But the right is not taking its impending defeat lightly; it has been orchestrating a massive fear campaign and has worked feverishly to secure corporate-driven development contracts before its rule is set to expire. "An historical event is underway in El Salvador. For the first time, a government especially dedicated to the popular sectors is possible. The current government, subjected to the interests of small groups, has shown their inability to lead the country for the common good. A new government is born precisely of the hope of citizens to break the pattern and install a government that will be at the service of the entire Salvadoran population." FMLN members celebrate victories on January 18. January 20, 2009 -- Amanda Peters was on the spot as an official observer, and as part of a delegation from CISPES (Committee in Solidarity with the People of El Salvador). She spoke with community radio's Latin Radical as the first results started coming in, and gives her nervous prognosis for the presidential round coming up on March 15.